Two last minute substitute maestros on the Philadelphia Orchestra podium this month were anything but knock-offs. 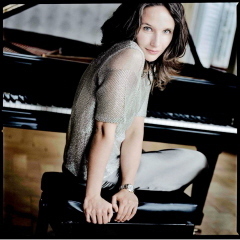 The celebrated pianist Helene Grimaud, was to perform with the orchestra and Yannick Nezet Seguin conducting on the Dec. 5-7 series of three concerts. Nezet-Seguin was in Canada, advised by doctors not to fly because of a severe sinus infection.The always fun to watch Michael Tilson Thomas graciously filled in for him. As he has shown before, Tilson-Thomas taps hidden qualities of the Philadelphia Orchestra in unpredictable ways, not to mention his deportment -- a cross between conductor serious, wry and total funsies. Grimaud was scheduled to play Brahms Piano Con. No. 2, but changed the program to Brahms Piano Con. No. 1. Whether or not these programs changes led to the sterile opening Brahms first movement is unclear. There is a long symphonic opening and Tilson-Thomas turned up the sonic intensity right away. Grimaud's entrance was subtle and fine, but for most of the movement she seemed too much in her own wind-up zone (and literally, Grimaud oscillates her body before playing denser sections). Some of the passages sounded like the orchestra and the soloists were in different rooms. Soon enough though, everything interlocked in the last two movements, with Grimaud and these players essaying luxurious and exploratory Brahms. Grimauld compelling accented the undercurrent Germanic pulse of the work. The pianist played some passages in the old style, with palm raised and fingers rigid, pounding the keyboard, but not for show, and the technical dexterity of the runs just transported. Meanwhile the orchestral thrust, truly fine underscored by those Fab Phil Brahmsean strings in full striated bloom. After intermission, Tilson Thomas brought out all of dimensions to Berloiz's masterpiece Symphonie Fantastique. The dark largo first movement (Daydreams and Passions) swirled around with mystery and drama. The lightness of the waltz variation (The Ball), played with so much wit and esprit. The woodwinds so serenely confident in the Adagio evoking 'In the Meadow' Tilson-Thomas rolls out the fantasia with such care and engulfing intensity. He also seems to have so much fun with the musicians. Many famous passages are in the Fantastique, and Tilson Thomas enfolds them so masterfully, with vibrant pacing. He never leans on them to carry the piece, even if he does cue some vamping from some of the musicians. The following week, another conductor absence prompted a home team, when Spanish conductor Pablo Heras-Casado had to bow out and return to Spain because of a family emergency. 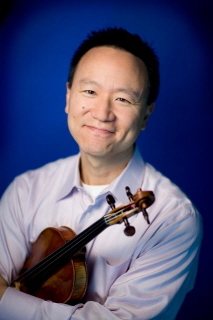 The Dec. 12-14 series featured Philadelphia Orchestra principal violinist David Kim as soloist on two Tchaikovsky works. The orchestra's associate conductor, Cristian Macelaru stepped in valiantly without changing the program and proved that he had much to offer at a moments notice. Macelaru showed immediate interpretive authority with Ravel's Rapsodie espagnole- the Prelude of the Night opening just conjuring sensorial realms and earthy evocations. His bold accents and illuminations seemed a clear indication to what he brings to French repertoire. The mystery and the sensual drama of Ravel's brought to full intoxicating bloom. The woodwinds vibrantly driving the orchestral thrust and the lower strings essayed the lush undercurrent. Kim, stellar on any given program as principal violin is an unfussy soloist and his entrance on Tchaikovsky's melancholque showed his rich tones right away. The he seemed a bit under-powered for the orchestral overlays. Within seconds, everything equalized for most of the performance, admirably avoiding any vamping of the theme, going much deeper to the heart of the work and revealing its genuine pathos. Tchaikovsky's emotional expressionism, indeed this was composed, as noted in the program, around the time the composer decided to enter into a marriage to provide a cover for his gay life. Tchaikovsky was profoundly unhappy about this forced circumstance, and this turmoil is evident in the theme. Next, there was no mistaking Kim joy in his virtuosity of Tchaikovsky's Valse Scherzo, especially digging into to that galloping fiddler ride. Macelaru's next conducts a raucous, evocative version of Stravinsky's ballet score to Petrushka. The score is, in fact, as brutal in parts as Le Sacre du Printemps and as romantic as The Firebird. Macelaru deftly illuminates the dual musicality. Jeffrey Khaner's flute voicing were so vivid and Kiyoko Takeuti's piano essaying Stravinsky's driving chromatic expression of Petrushka's trapped tragedy. The puppet gets killed in the end by the circus' evil impresario, and the carnage is cued by brutal horn assaults that just scorched the hall in burnished effects. Stravinsky's irony in this under appreciated ballet is fully realized by the Fab Phils and this maestro.